Saturday 20th and Sunday 21st October. 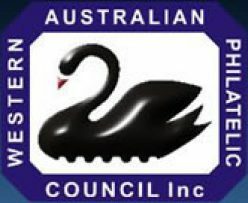 This was the second year that the Show was held at the Leederville venue. Attendance figures were higher than last year, with free entry and moving away from the AFL Grand Final weekend being significant factors. However, the numbers were still disappointing for what is meant to be WA’s major annual philatelic event. 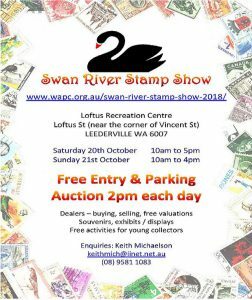 Noise factors, parking problems and poor cooperation from the Centre’s management have made it imperative that Swan River Stamp Show is moved to a new venue. To that end, next year’s show will be held at the Cannington Agricultural Hall on the weekend of October 5th and 6th. The organisation leading up to the show went smoothly due to the hard work of the committee. It was during this time that we realised how much Ross Wood and Mike Rhodes had contributed to the event over the years; they were sorely missed. Despite several difficulties, set-up and dismantling went remarkably well, with many volunteers turning up to help with mounting of the displays. The entry table was manned by members of several clubs. Information from daily door prize entry forms, once collated, should bring new members to clubs. Best in Show was awarded to Bruce Haynes for his excellent presentation on Ceylon Boer War Camp mails. Of special interest was John DiBiase’ invited display Western Australia, The Postal History 1878-1913. No junior displays were received. Judging has always been carried out in the week before the show. In future, judging will be done two weeks before the show to allow more time for the information to be passed along for medal engraving, catalogue and certificate printing. Eleven local and interstate dealers attended, providing products and needs for all classes of collectors. Apart from some first day covers, show souvenirs were sold out. This was partly due to the sales table being prominently located near the entry and partly due to limited numbers of souvenirs being available for sale. Souvenirs included P-sheets, mini-sheets, booklets and first day covers. Auctions were held on both days. Unfortunately, noise from adjacent sports courts proved to be a considerable nuisance. More young collectors visited the Youth area this year. Some were already collectors, some just starting out, some (attending other events at the Centre) visiting the show to satisfy their curiosity. Youth activities included games, quizzes and coin rubbing. All youth visitors received a free show bag of goodies. The Palmares dinner was held at Southern Star Restaurant, Perth, with an excellent set menu.